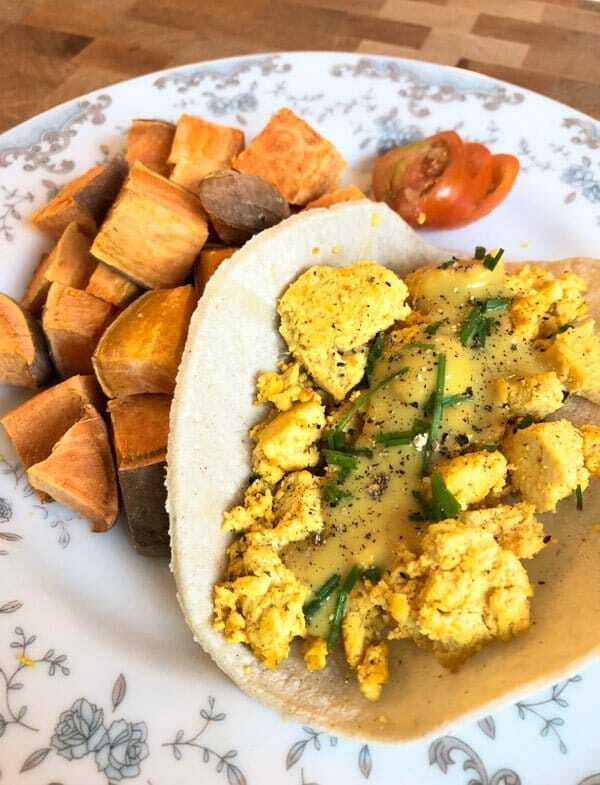 Scrambled tofu served with roasted sweet potatoes and white bean hollandaise sauce. 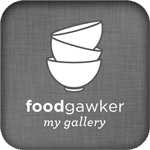 This is a guest post from Joey Bruno – Thrive Cuisine. 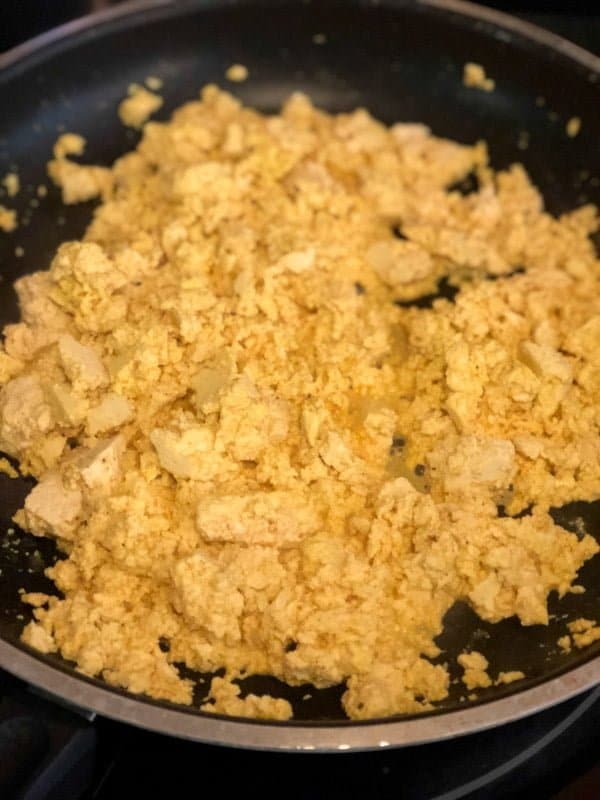 Step-by-step instructions on how to make tofu scramble. And to make this vegan meal complete: roasted sweet potatoes and white bean hollandaise. Enjoy! I’m going to be honest. Before I tried it, the thought of a tofu scramble sounded kind of weird. I wasn’t sure that it would be satisfying, and I couldn’t imagine tofu being flavorful enough to replace eggs, but I am happy to say that I was wrong. It’s amazing how similar tofu can be to real eggs, and this is one quick, satisfying meal to have in your recipe arsenal. It can be eaten as breakfast, lunch, or even dinner and it can be adapted to meet any flavor craving. 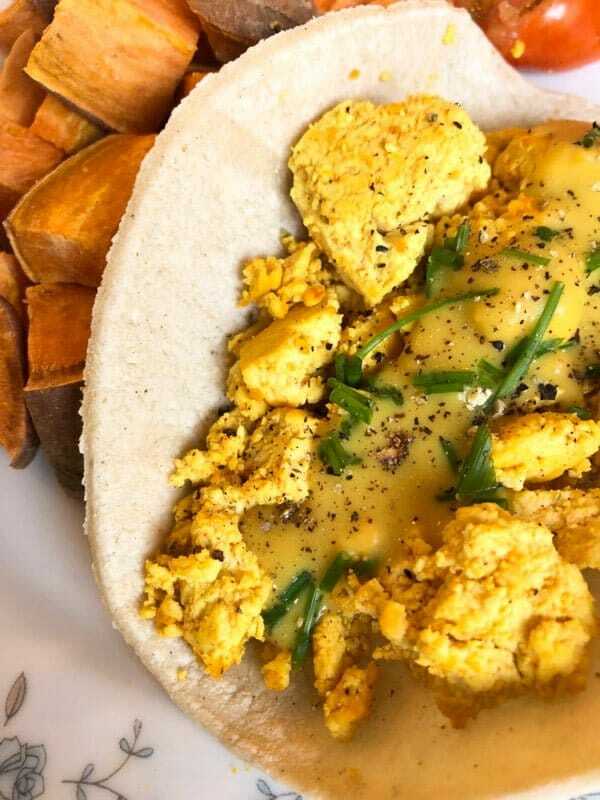 This recipe pairs scrambled tofu with roasted sweet potatoes and white bean hollandaise to create a scrumptious dish that would be perfect for a sophisticated brunch. The scrambled tofu serves as the base of this dish. It provides a fulfilling and nutritious vehicle for some delicious flavor combinations. Sweet potatoes do an excellent job of providing texture variety in this dish. They also add a pop of sweetness to an otherwise savory dish, creating a delicious and surprising flavor combination. The white bean hollandaise turns this recipe into a truly filling meal. While all the ingredients look simple, it’s amazing how rich and elevated the sauce becomes when you throw it in a blender and let everything become creamy. The sauce is far lower in fat and calories than a regular hollandaise sauce, but you can add some soaked cashews or tahini if you want to make it even richer. 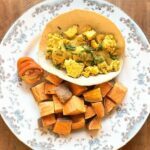 The turmeric adds the yellow coloring to make this look more authentically like a scramble, but if you don’t have it on hand, the flavor will still be fantastic. A little attention to detail makes this a truly refined dish. 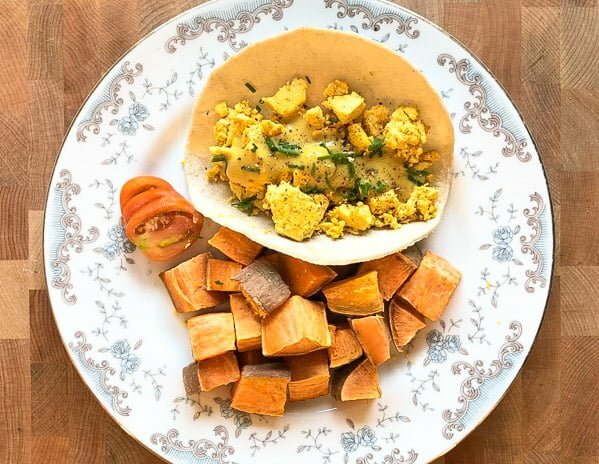 Serving the scramble over a corn tortilla (try a blue one for an extra visual bang) and using chives to really bring the flavor together makes this a recipe to be remembered. By the way, you don’t really need all these ingredients to make a tofu scramble. A block of tofu and salt and pepper is really all it takes, and it serves as a great base to add whatever you have on hand. 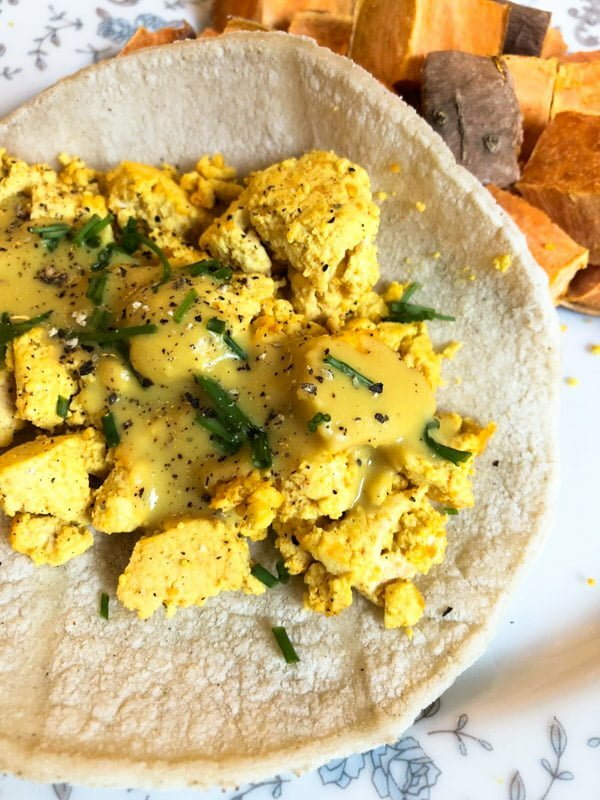 If you’re new to tofu scrambles, don’t be intimidated! This recipe is a bit fancy and designed to take things to the next level. While it’s not a critical step, it helps to press the tofu before putting it in the pan. You can either use a full-on tofu press to get the full effect or simply put it down with paper towels and press it by hand. You can even purchase tofu that’s already been drained, and vacuum sealed rather than the normal block sitting in water. When you place the tofu in the pan, be sure to “crumble” it with your hands so that it gets the look and texture you want for a scramble. Don’t try breaking it up with a spatula after you put it in the pan. Using your hands are the best method by far. Most of the cooking process is simply water evaporating before the tofu starts to get slightly crispy and “egg-like.” The more water you can get out of the block, the faster it will cook. 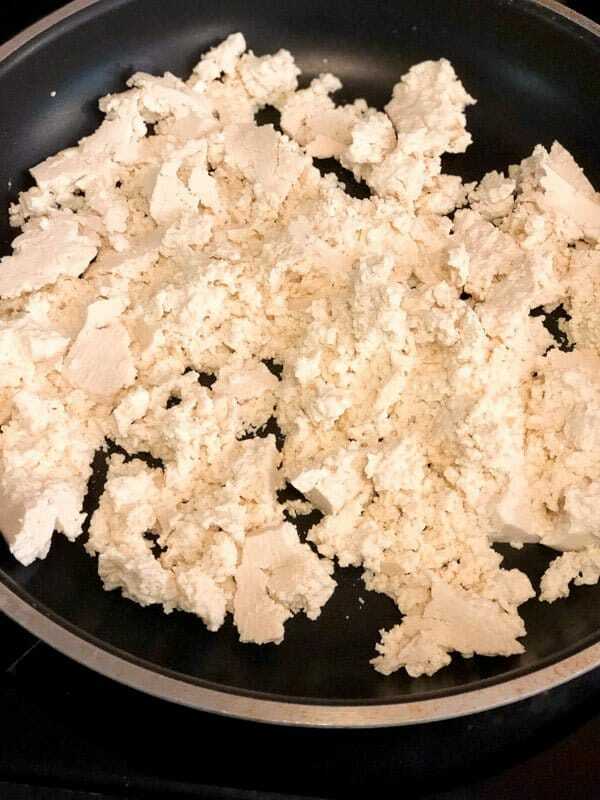 The tofu will go through different “phases” while you’re cooking it, and it may not look much like a scramble at first. Patience is key. Cut 2 or 3 large sweet potatoes into cubes and place into oven sprinkled with sea salt at 350 for 30-45 minutes or until outside is crispy and inside is soft. 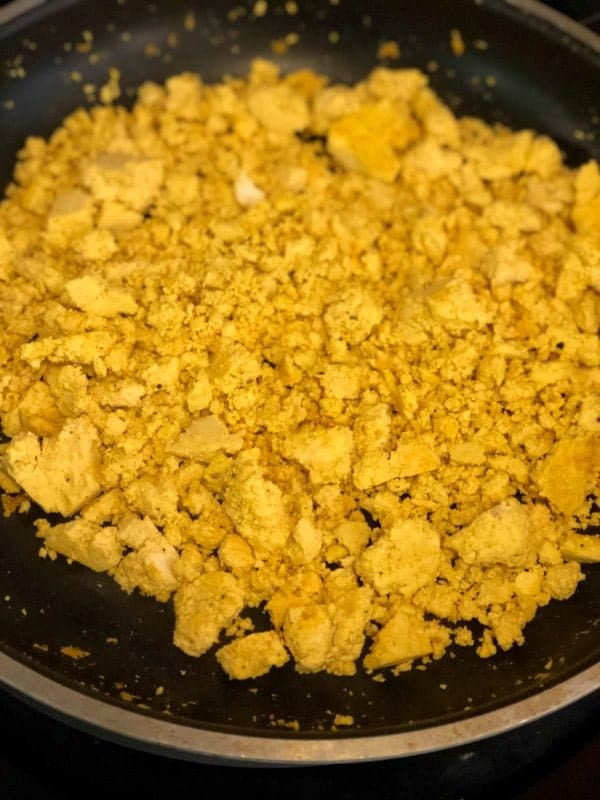 Crumble the block of tofu into a nonstick pan and add all the ingredients. Keep it on a medium/low heat and mix every few minutes. Resist the temptation to turn it on too high as it will burn rather than brown. During this time, make the hollandaise sauce in a blender with all listed ingredients. Feel free to add more water if you’re having trouble blending or to thin out the sauce. Once everything is fully cooked, assemble as seen in the photo or simply serve the scramble over the sweet potatoes. My gosh i am not a tofu fan but this looks delicious.. And that yellow sauce is just fabulous… Its creamy and yeah will definitely give the perfect texture to the tofu.